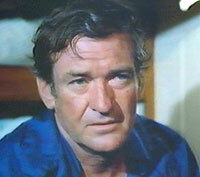 Rod Taylor starred in and wrote the screenplay for this adventure movie shot in Jamaica. I got the idea from a newspaper. I read about divers finding a sunken city with $6 million worth of bullion. This is the story of their efforts to get it up and their fights to keep it. I do a lot of rewriting but this is the first one from scratch. There are not enough good scripts around and God knows, I read enough of them. I've gone through reams of junk. The same 1975 article mentioned that the cast was to include Stuart Whitman, James Mason and Ursula Andress. When filming started in May 1976, Whitman was there, but it looks like the other two parts were filled by Jeremy Kemp and Elke Sommer. Also in the cast are veteran actor Keenan Wynn and Robert (Bob) Phillips, who appeared with Rod in "Darker than Amber." about to dive for pirate treasure. All the filming was done in locations in and around Montego Bay and Kingston, including tourist locales such as Admiral's Inn, Colbeck Castle and Bowden Wharf. 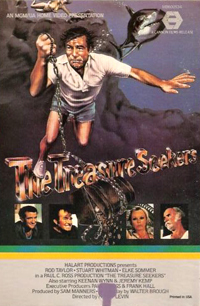 The original working title of the movie was "Jamaican Pie," but it went through several name and distributor changes before it was released on video in 1979 as "The Treasure Seekers." Other aliases include "On a Dead Man's Chest," "Contraband," "Forty Million Bucks" and "Jamaican Gold" (the title that's used for the movie's IMDb entry). Rod was one of the driving forces behind the project and had several friends among the crew. However, according to Stephen Vagg's biography, "Rod Taylor: An Aussie in Hollywood," Rod seemed to get "squeezed out" as the production progressed. The script was re-written by Walter Brough, an experienced TV writer who disputed Rod's claim to a writing credit. And as filming wrapped up, Vagg notes that the movie essentially had no producer. The movie never had a theatrical release and eventually came out on video in 1979. This development surprised Rod, who was handed a copy of it to autograph a few years later. "Those bastards changed the title and released it on tape," Rod said, "and I still haven't been paid!" 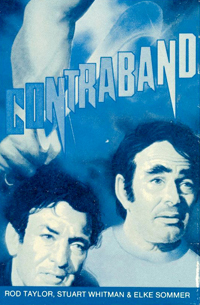 The plot involves two old college buddies -- Marian Casey (Rod) and Stack Baker (Stuart Whitman) -- meeting by chance at the Montego Bay Marina many years after their shared football glories. Baker sets out to show Casey around the island and introduce him to friends. But they soon get mixed up in a family feud that includes a quest for $40 million in pirate treasure. On one side of the feud is Meat Cleaver Stewart (Keenan Wynn), a gruff scavenger with a lovely daughter, a treasure map but no money to fund a proper search. His adversary is the Right Honorable Reginald Landers (Jeremy Kemp). He is a wealthy scoundrel with a lovely mistress (Elke Sommer), the funds to carry out a search, and the henchmen to kill Stewart in his pursuit of the map. In the wake of this heinous crime, it's Casey and Baker who get their hands on the map and decipher further clues to find the treasure. Once they locate the gold, they are almost done in by Landers, who traps them in an underwater cave. Some nifty swimming and a surprise twist wrap up their adventures. Throughout the film, Taylor and Whitman seem to be having a grand time, but their (aging) he-man antics and bravado can't overcome the movie's low production values and questionable wardrobe choices. In an interesting casting note, Patrice Wymore is credited with a cameo in the film. Wymore is the widow of Errol Flynn, making for a connection from the first great Hollywood star from Down Under and the second -- Rod Taylor. At the time of the filming, Wymore ran the Jamaican estate the couple owned together before Flynn's death in 1959. On the 2,000-acre property outside Port Antonio, Jamaica, she farmed coconut trees and raised cattle. She also owned two dress boutiques and a wicker furniture factory.